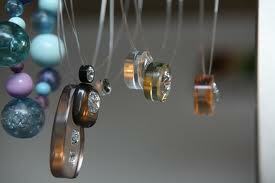 Our client a marketing firm, was working with Alana Moray Club Jewelry* a new luxury brand of pendants. Alana Moray is the brand name for jewelry designs created and inspired by the socialite and actress Alana Morton. The pendants are mementos from popular clubs located all over the world, from New York City and London to Gstaad and Cannes. Each pendant is imprinted with the name of the club and its logo, and represents fun, glamour and adventure. The pendants can be purchased in sterling silver or 14k gold. The target audience is young women from the age of 21 to 34. Alana Moray sought to increase brand exposure in the LA market by sponsoring weekend mobile marketing campaigns focused on LA club goers. Alana Moray had a huge following on Facebook and Twitter, but it wasn’t really translating to an increase in jewelry sales. Now the agency wanted to add SMS to the marketing mix and implemented a text-to-win opportunity for club goers to win a 14k gold pendant inscribed with the name and logo of the popular LA dance club Boulevard3. The object was to collect mobile numbers on site at the club. The campaign was promoted with flyers offering drink tickets that were given to guests when they entered the club. To get a free drink, clubgoers had to text to the Alana Moray campaign number. Then they were invited to enter into the contest for the Alana Moray pendant. Winners were notified every Saturday night at midnight by text, on the wide screen monitors in the club, and announcements made by the deejay. *Alana Moray Club Jewelry is a fictitious name to protect the agency’s confidential white label solution with ProTexting.com!